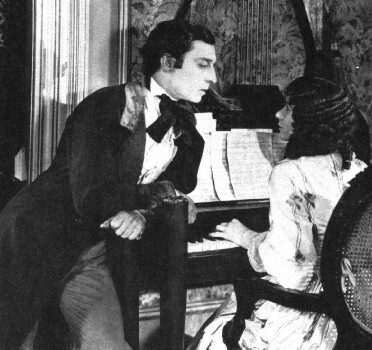 Buster Keaton and Natalie Talmadge play star crossed lovers in "Our Hospitality"
Sole heir Willie McKay (Buster Keaton) journeys by train from New York City to Kentucky to claim his fortune amid a decades-old feud with the Canfield family. En route, he meets and is smitten with young beauty Virginia (Natalie Talmadge), who invites him to dinner, but he realizes too late that she is the only daughter of patriarch Joseph Canfield (Joe Roberts). The rules of hospitality protect McKay from harm in their house, but he must outwit her brothers to resolve the feud. Silent film with live accompaniment by Marta Waterman.